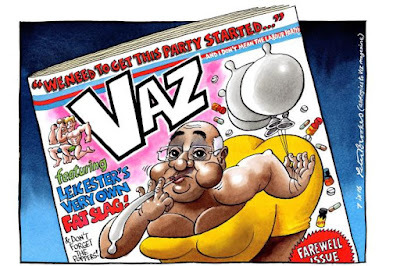 Ironically, this Times' cartoon by Peter Brookes is, like Viz, not very funny, but rather childish and 'ironically' bigoted. Another great pun by Dave Brown at The Independent (no idea why it's taken cartoonists three days to get around to this). Samuel Butler after the Wilde trials.